If you're a developer, you can purchase the EasyPattern Engine to use in your own applications, royalty free! 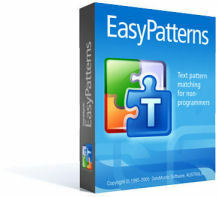 The Engine allows your users to enter text patterns using the very English-like and friendly structure of EasyPatterns rather than the difficult to use perl-style regular expressions. The EasyPattern Engine is a COM DLL that provides EasyPattern to perl regex conversion, and is highly optimized to generate the most efficient regex code. We welcome suggestions for extensions to the EasyPattern language - please contact us. We also recommend and use the DIPCRE component from The Delphi Inspiration to provide the perl-compatible regular expression engine used by EasyPattern Helper. You can choose to incorporate the EasyPattern reference material in your help file, on your website, or even link to the reference on our website. You can also modify the documentation, which you may wish to do if you only use it for searching and not for replacing, or if you want to reduce or restructure the information.